Hey, remember the graph paper pictures? 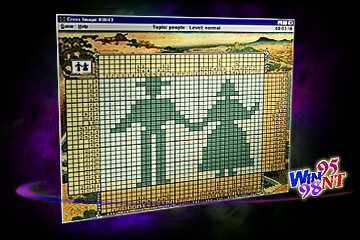 Well, they're back in Cross Image and we've added a special twist just for you puzzle lovers. O.K. got your thinking caps on? This is how it works. You have to figure out where those filled in little squares go by looking at cross-reference numbers we give you. Oh I know, you think it's easy. Well, tell you what, why don't you download our game and try it out? You get 3 games for free and you'll really get to see how good you are. But I better warn you; they're pretty addictive, especially for you ingenious puzzlers. After you have sampled the fun, we know you'll want to have all 100 puzzles that include 3 levels of complexity. Additional picture labriraries of 100 puzzles each coming soon together with Cross Image Puzzle Editor, which will enable you to create your own puzzles and send them to our friends! We've included sound effects, a dazzling array of color after solving each puzzle, and if that wasn't enough, you can even print puzzles out so you can lay in bed with a nice cup of Cocoa and relax the night away. What more could you want?